Saturday night Forecast: Increasing clouds. A slight chance of light snow or a wintry mix late. 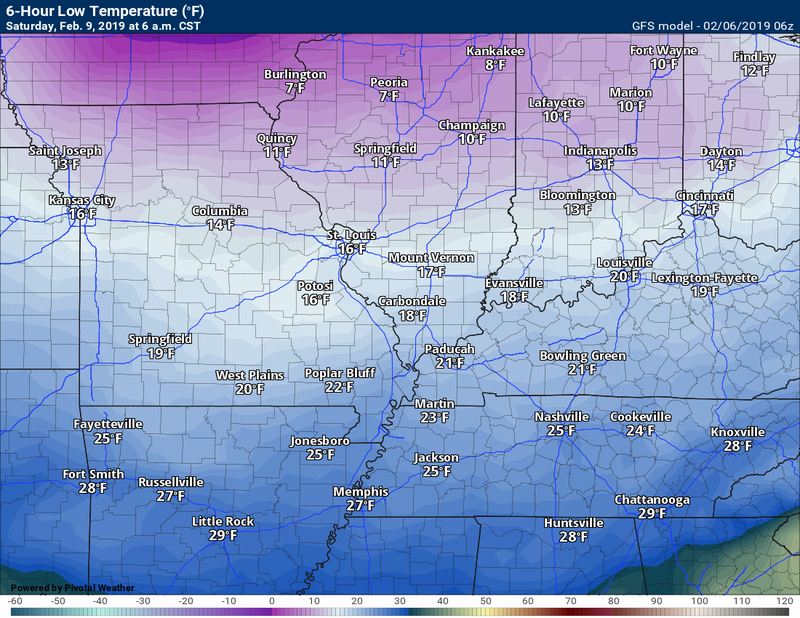 Best chance would be across southeast Missouri after midnight. Whether it spreads further east is still questionable. Sunday’s Forecast: Cloudy with a chance of freezing rain, sleet, and snow changing to rain. It may remain all rain over the southern half of the region. 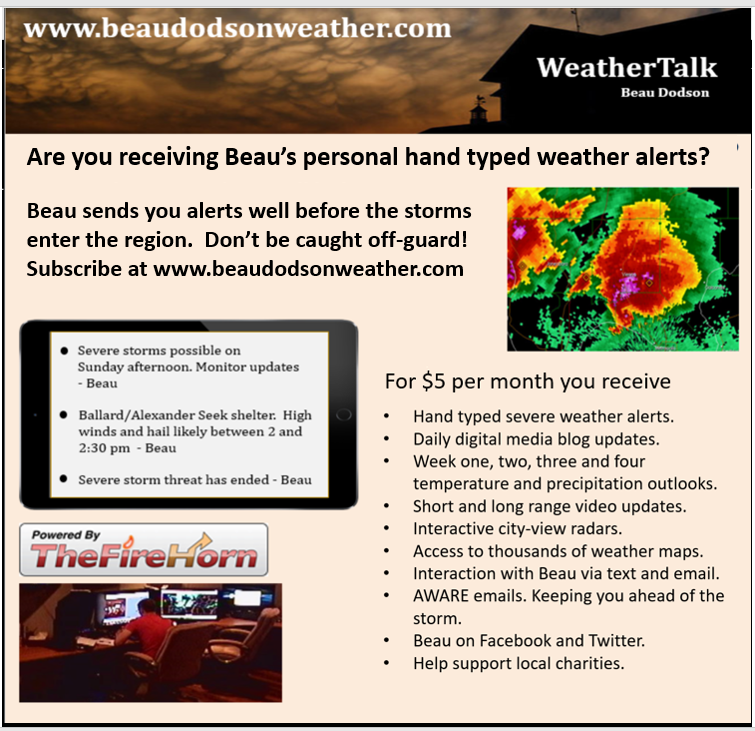 Monitor the forecast for more specific details. 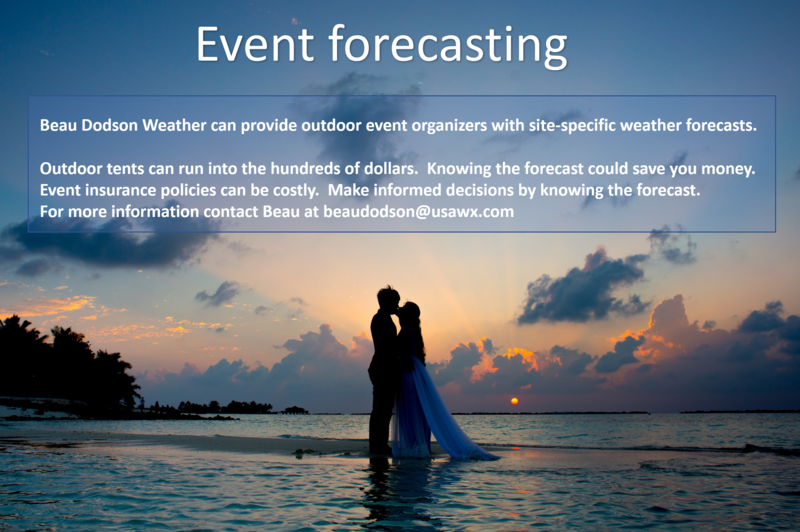 What impacts are anticipated from the weather? Icy roads are possible early in the day. Wet roadways during the afternoon. 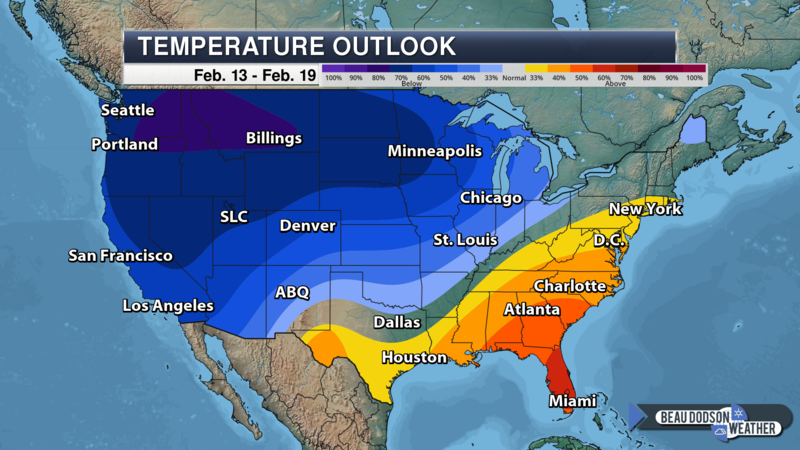 There is lower than normal confidence in the forecast from Monday into Wednesday. 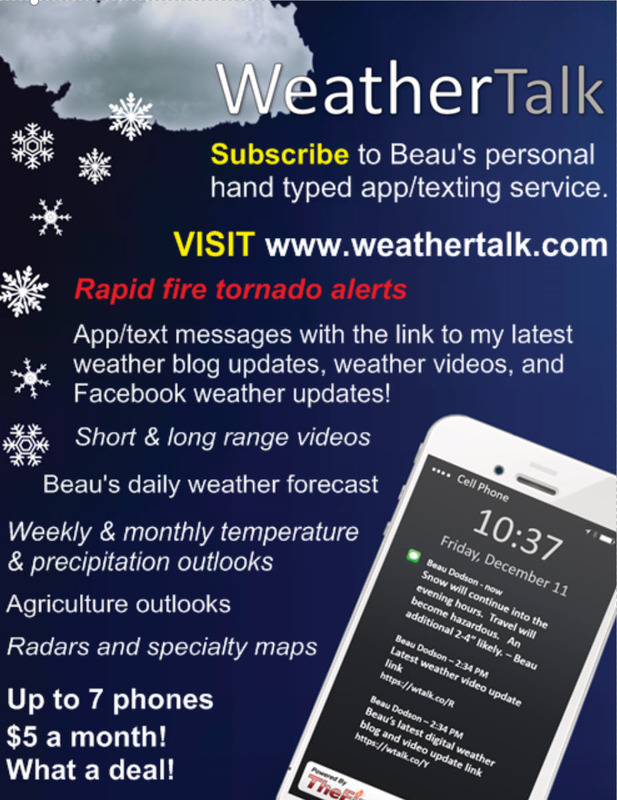 Some guidance indicates the potential of a winter storm. Confidence in that happening is very low. Monday’s Forecast: Cloudy. A wintry mix or snow changing to rain. It may remain all rain over the southern half of the region. 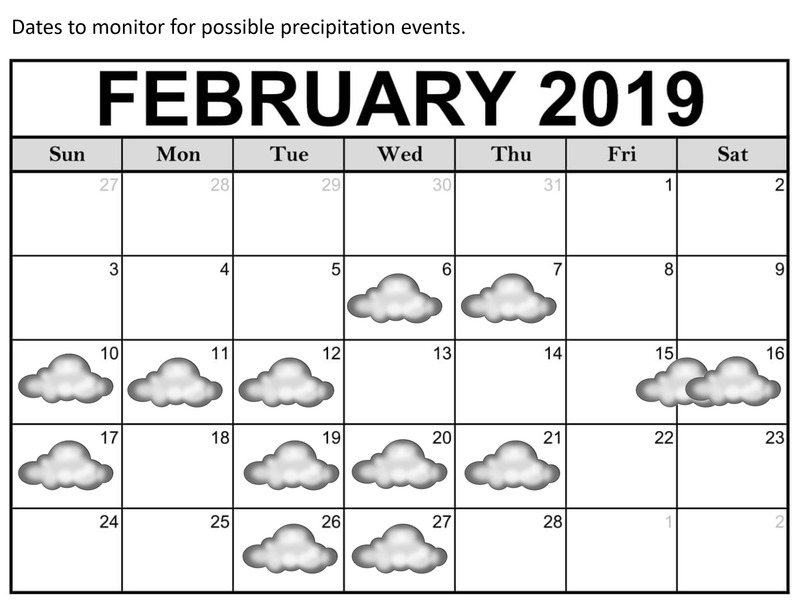 Monitor the forecast for more specific details. Tuesday night Forecast: Cloudy. Rain showers. Rain may change to snow. 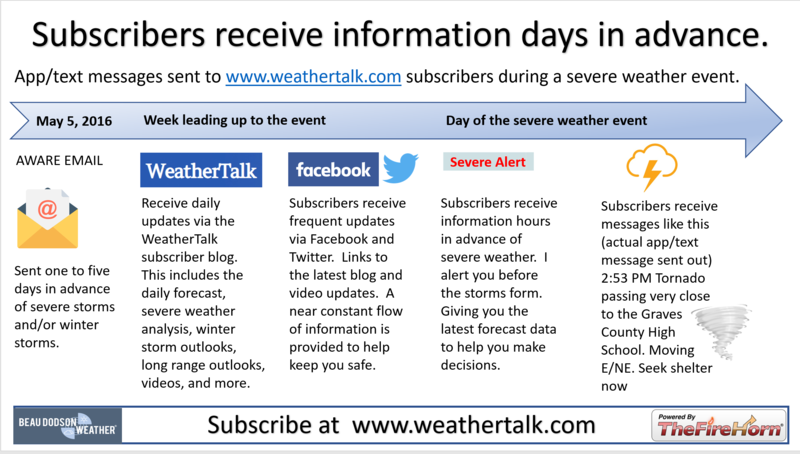 What impacts are anticipated from the weather? Wet roadways. Monitor the risk of flooding. Monitor the risk of snow. 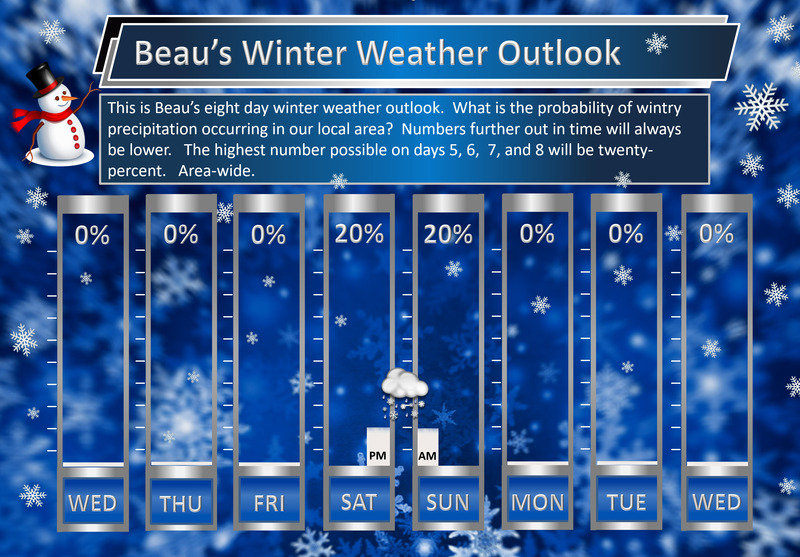 Thursday night through Sunday: A small chance of rain ending as light snow Thursday evening/night. No accumulation. 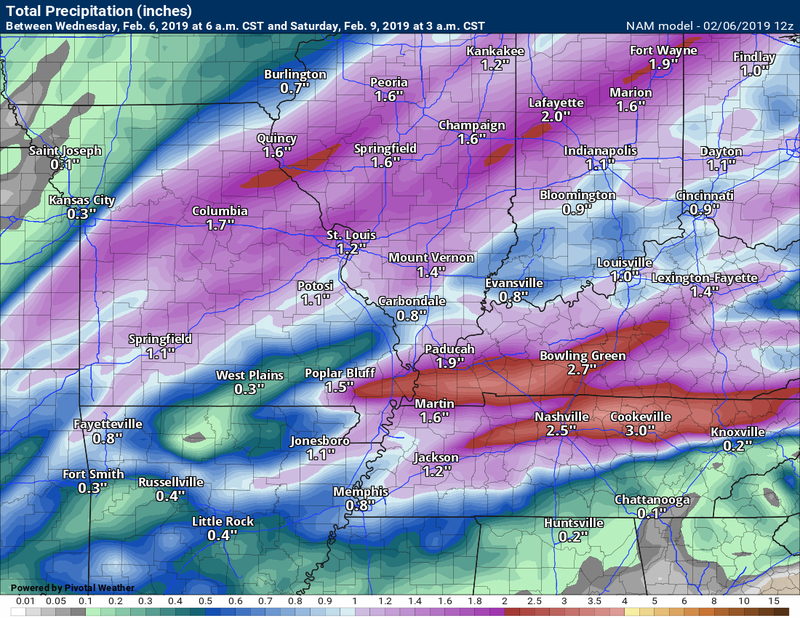 Precipitation returns late Saturday night into Sunday morning. It may begin as a wintry mix before changing to all rain as temperatures rise. 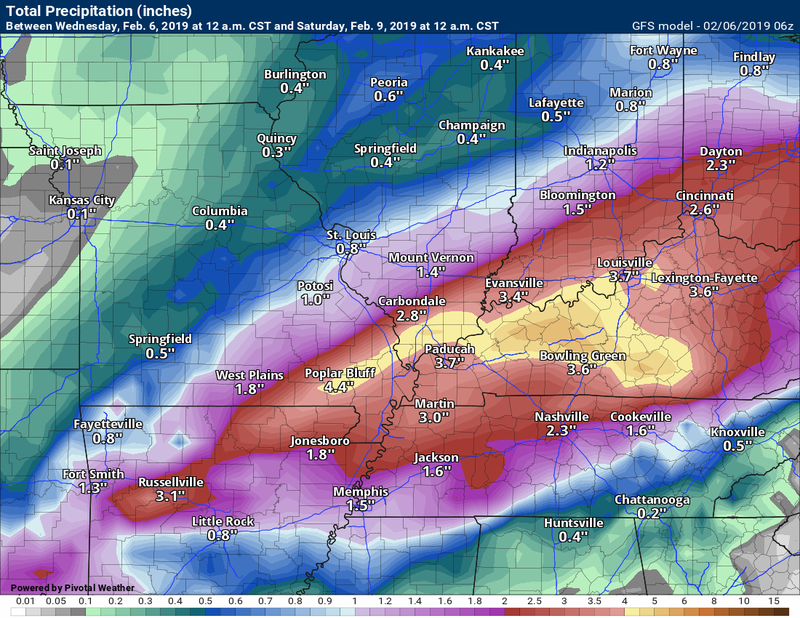 This is the 48-hour rainfall forecast map. 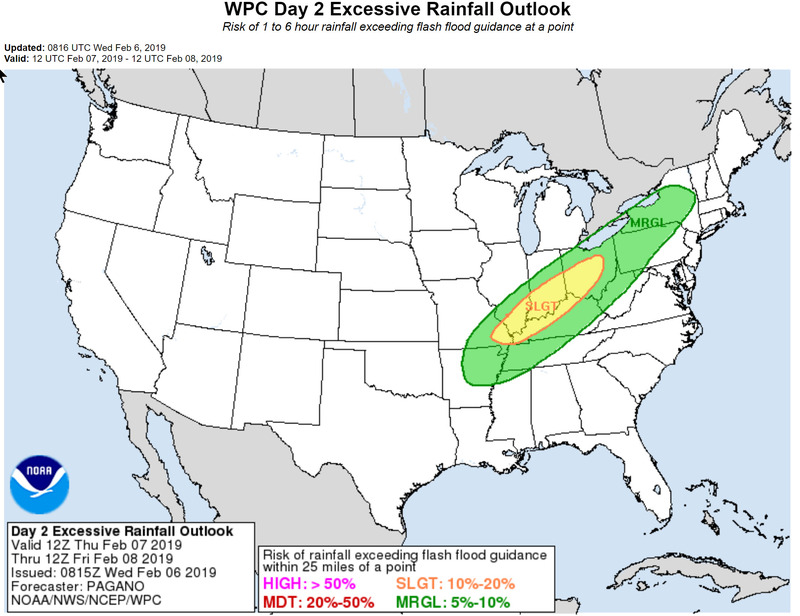 WPC/NOAA made a shift southward and lowered totals from previous outlooks. Still, this is a lot of rain. This map is more in line with my going forward numbers. Wednesday into Thursday morning: Lightning likely. I am monitoring the risk of strong to severe thunderstorms from Wednesday afternoon into early Thursday morning. Confidence in severe weather occurring is low. Thursday afternoon night into Monday: No severe weather concerns. Here is the SPC outlook for today and Thursday. This is mostly for late this afternoon into the overnight hours. 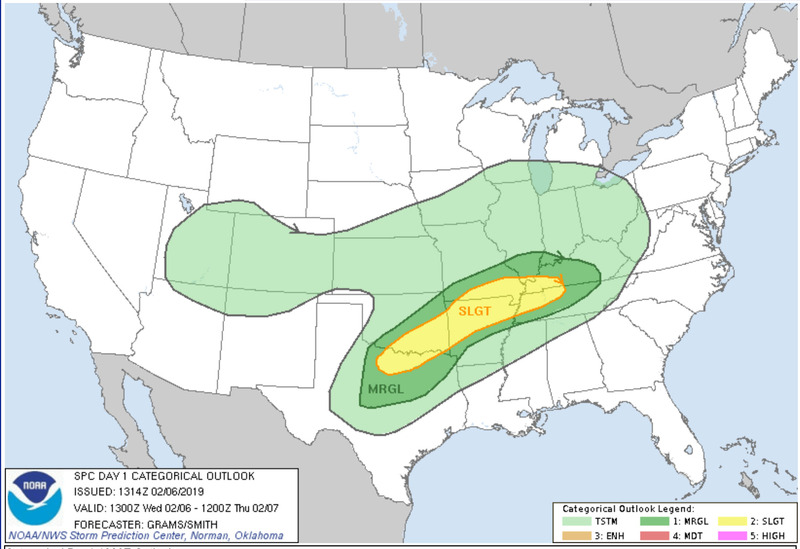 Dark green represents a marginal (level one severe risk out of five) risk. We will need to monitor Thursday morning. I am not sure if they upgrade us to a level two risk or not. Some severe storms are possible Thursday morning. Widespread rain event is underway. Concerns about flash flooding and river flooding are increasing. I am monitoring the risk of severe weather later today into tomorrow morning. Another rain event arrives late Saturday night into Tuesday night. 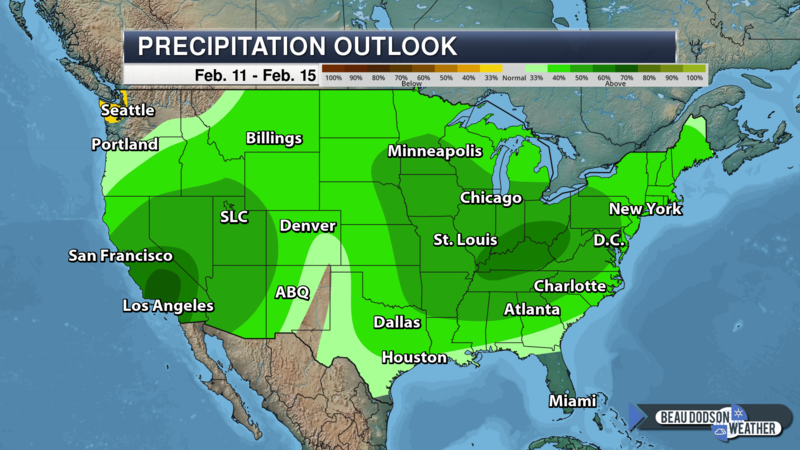 A prolonged period of unsettled weather ahead of us. Precipitation may begin as a wintry mix late Saturday night and Sunday morning. Precipitation should then turn to all rain as temperatures rise. I adjusted temperatures today to account for the placement of a stationary front. 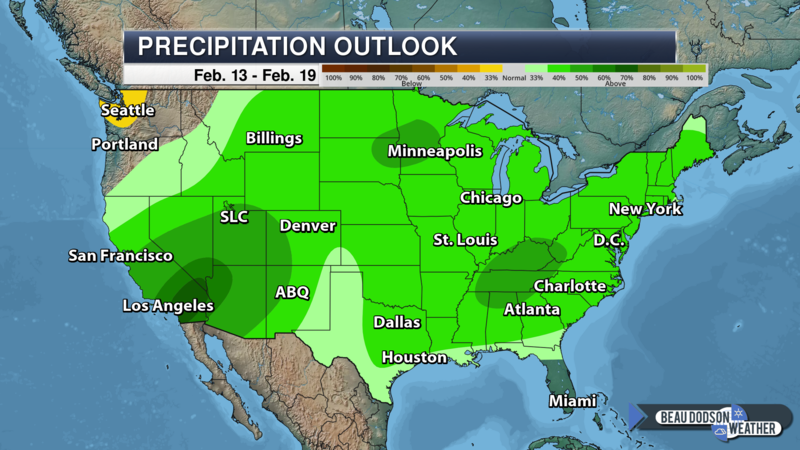 I switched out the NOAA rain totals forecast. They are more in line with my going forecast now. They had rain totals a bit too high. I adjusted weekend temperatures down by several degrees. 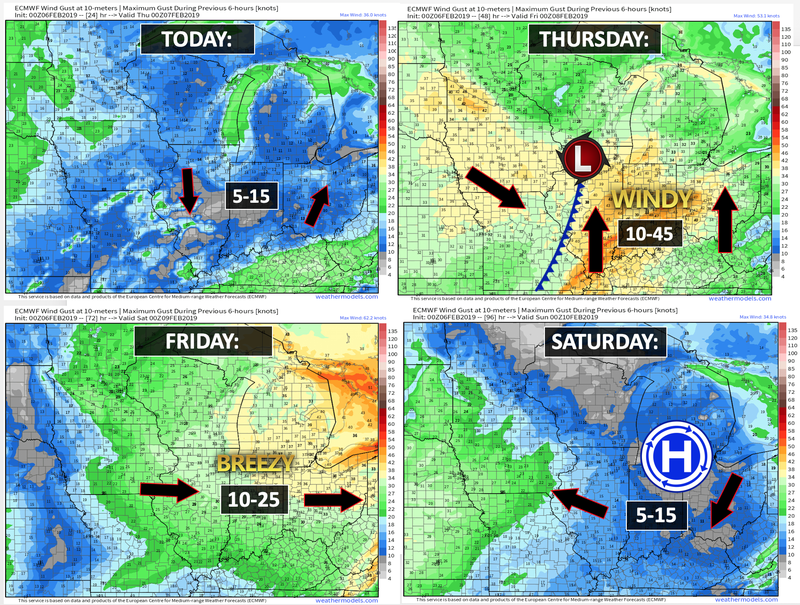 Overall, the core of the going forecast remains the same. 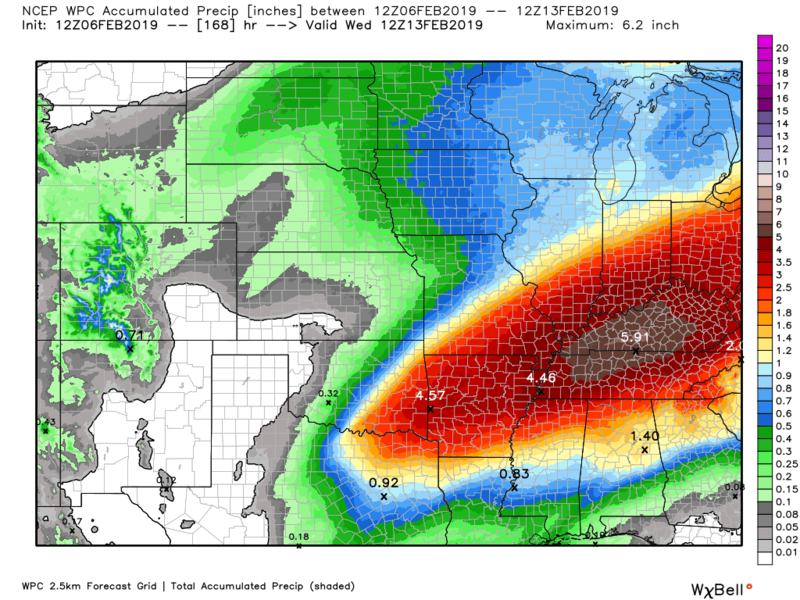 Heavy rain is a concern over the next 36 hours. 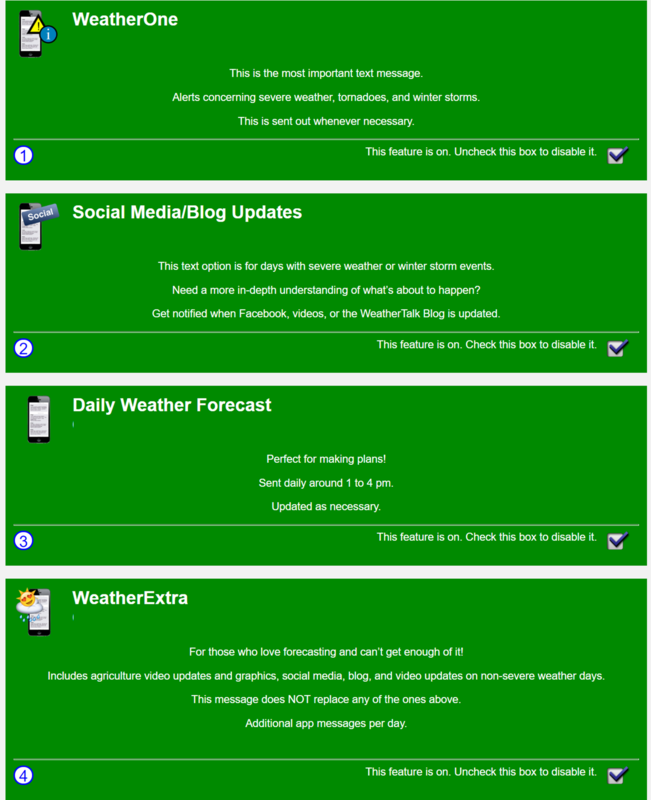 Monitor updated watches and warnings. Avoid flooded roadways. Some flood or flash flood warnings are possible. This is especially true where thunderstorms train over the same area. 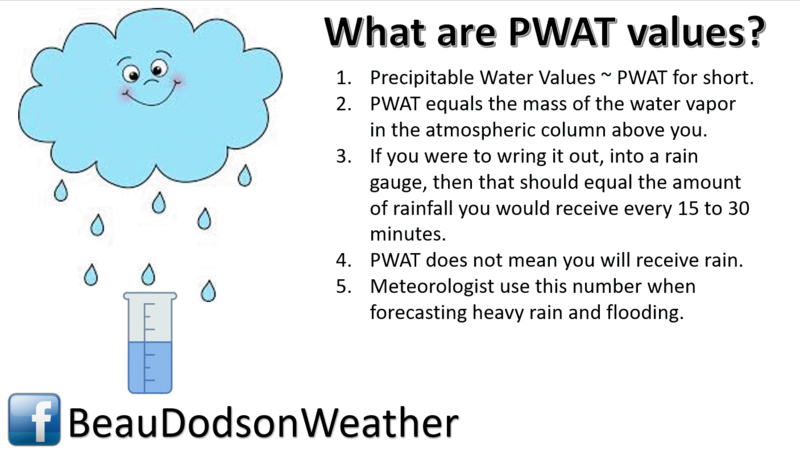 This can enhance rain totals. A few severe thunderstorms can’t be ruled out. The main concern will be Wednesday afternoon into early Thursday morning. The main concern continues to be our heavy rain event. Showers and thunderstorms occurred overnight. Some areas picked up more than an inch of rain. Many of you were awoken by lightning and thunder. This rain event is just beginning and will continue into Thursday. Rain will taper west to east late Thursday morning into the afternoon hours. 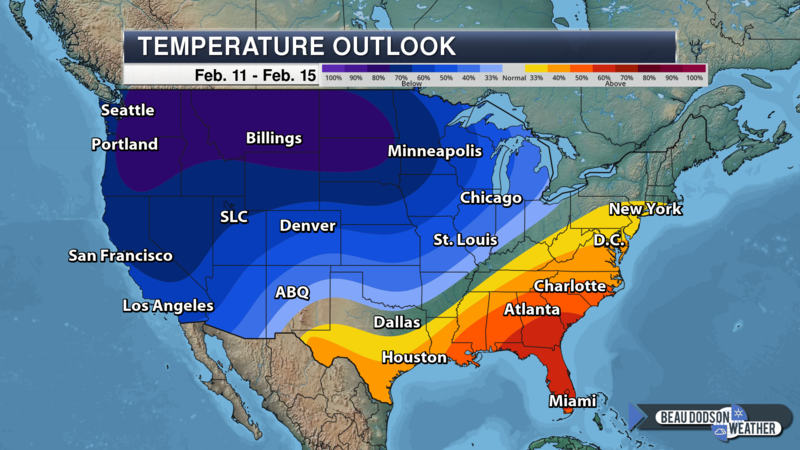 Temperatures will then crash behind the cold front. 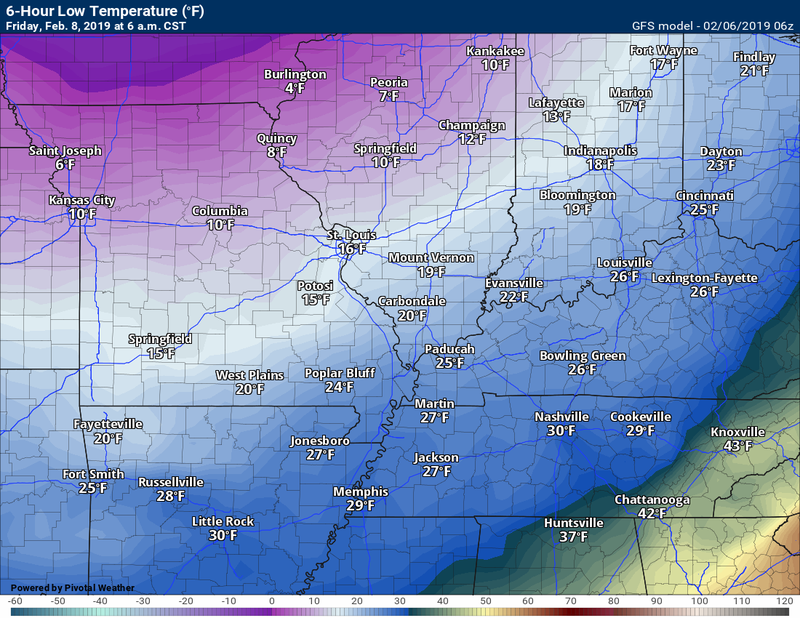 Here is the temperature animation that covers Thursday into Thursday night/Friday morning. Notice the sharp arctic front that pushes through the area. Rapidly falling temperatures could freeze any remaining moisture on parking lots and elsewhere. We call that black ice. 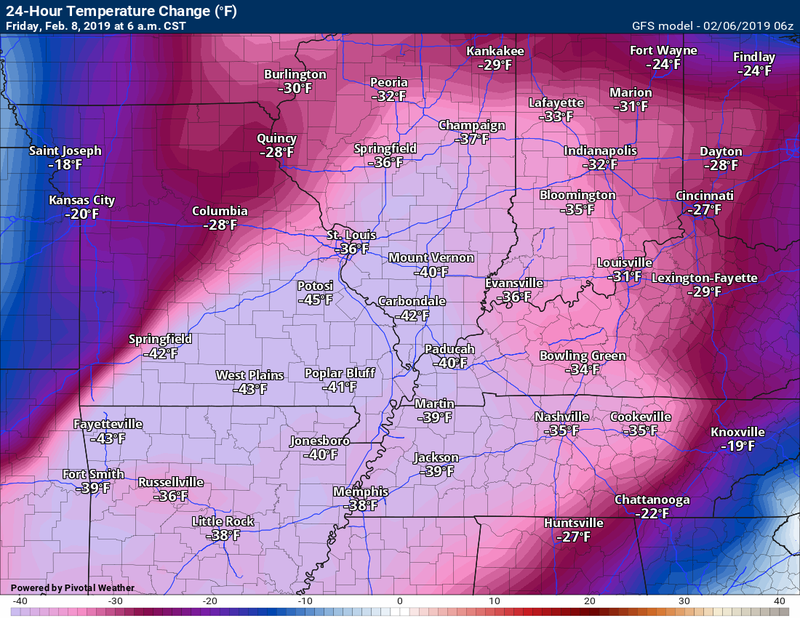 How many degrees colder will it be at 6 am Friday vs 6 am Thursday? Now that is a cold front! 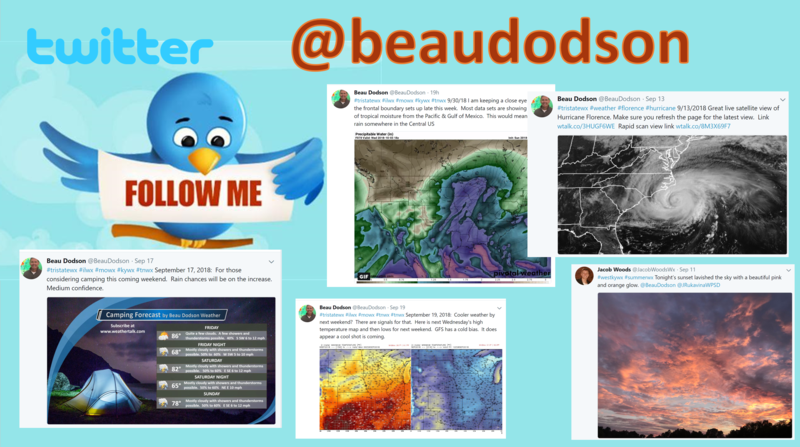 Let me show you some future-cast radar images from four models. Green is rain. Yellow and orange represent heavier rain. Red/purple is a wintry mix and freezing rain well to our north and northwest. Green is rain. Yellow is heavier rain. Blue is snow. Pink is a wintry mix. Time-stamp upper left hand corner. Several rounds of showers and thunderstorms anticipated. All of this rain is going to cause significant rises on area streams and rivers. Additional thunderstorms are possible, as well. 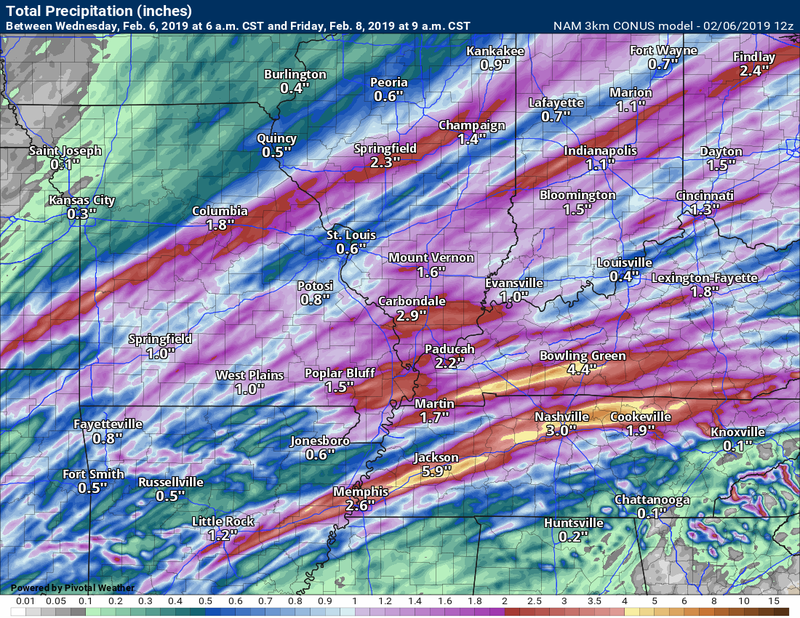 Thunderstorms will enhance rain totals. Thunderstorms will increase the risk of flooding. General flooding can be expected as ditches, streams, and rivers rise. A flood watch has been issued for all the area today into Thursday morning. Click to enlarge. Green is the watch zone. 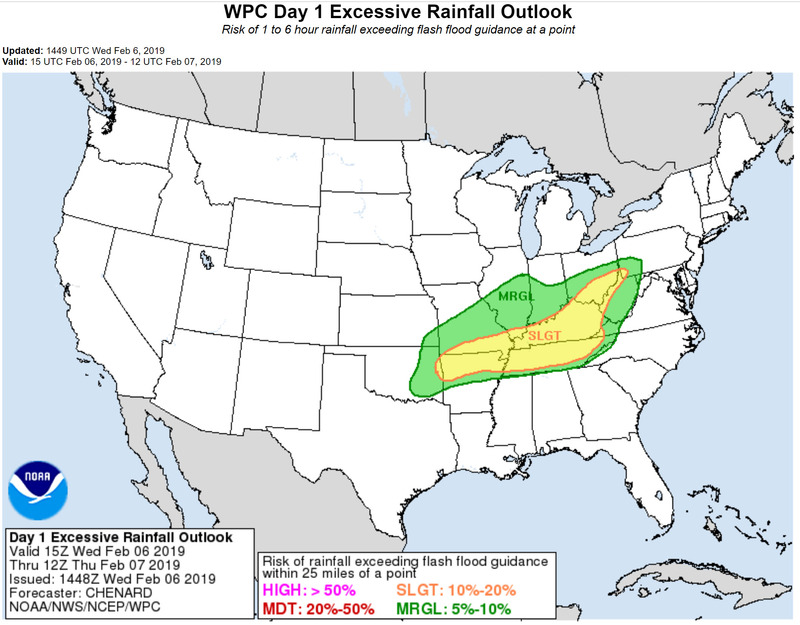 The WPC has outlined our region in a slight risk of flash flooding. They have a scale similar to the Storm Prediction Center. Basically, this means that some flooding will be possible over the next 48 hours. Rivers, of course, will flood over a longer period of time. Sharp rises on area rivers are likely. We also have a risk of a few severe thunderstorms Wednesday afternoon into Thursday morning. There will be plenty of clouds and ongoing rain. There remain questions about just how unstable the atmosphere will become. Confidence in severe weather developing remains fairly low. There will be some spin in the atmosphere. The main concern will be damaging wind gusts and isolated tornadoes. 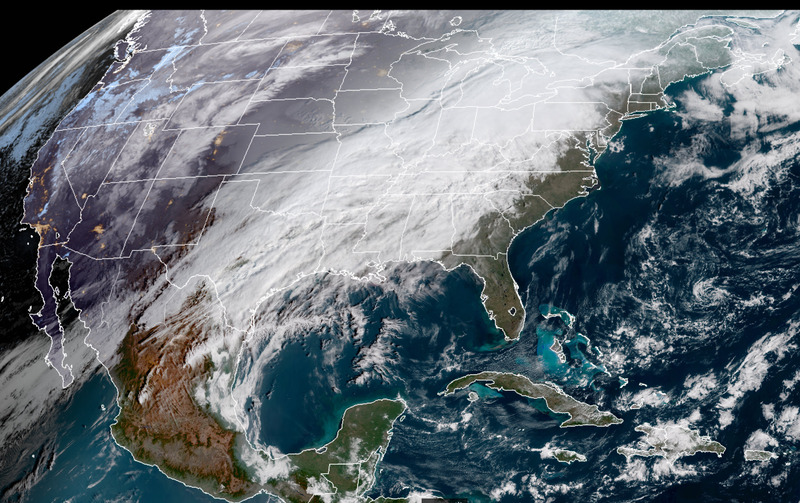 Those purple colors represent very high moisture plumes. 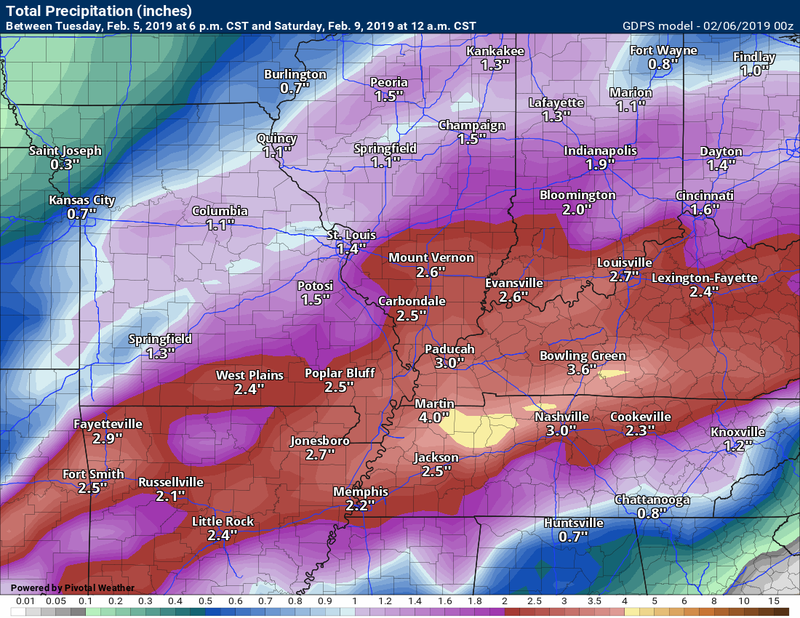 Models vary on rain totals over the next 36 hours. Generally I have been forecasting a widespread one to three inch rain event with stripes of greater than three inches possible. 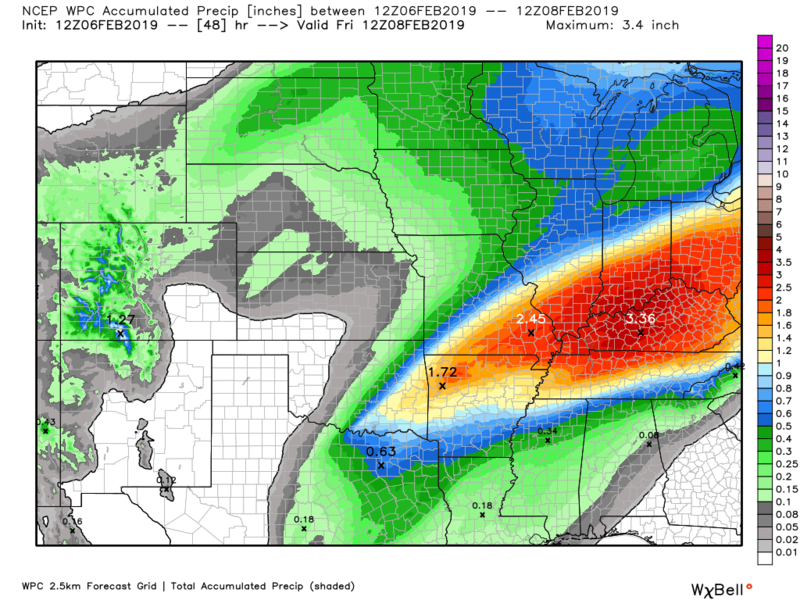 Another rain event arrives Sunday into Tuesday. It may begin as a wintry mix and then turn to all rain. That is the current forecast.